As my other paintings it is acrylic on canvas. I thought it will take me a week to finish, but it took much longer. Way longer – almost four weeks. All those squares in squares and circles in circles, 231 little elements, it takes a lot of work to make the hard lines look so crisp, very tedious work. But I loved every single minute of the process. Not sure yet how to name it. I am always interested in the so called ”behind the scenes”. So, if you are like me – here is the peek behind my curtain. On the easel is the painting I’m still working on, it is almost finished. One of my greatest art inspirations since my teenager years was, and still is, Jan Lenica. He was known as the art critic and major artist of the Polish poster school, set and theatre-costume designer, children’s book illustrator, postage stamp designer, and even a movie director. Just discovered Carmen Herrera via Netflix documentary. Wow! Love love LOVE her paintings, colors, shapes, everything feels like me. She says that painting flowers, nature, people etc. doesn’t interest her. Just shapes. And color. I feel the same. One of the most famous things we have in Sarasota is our sunsets. Because the Gulf Coast is facing the West, we have those mesmerizing views of sun disappearing behind the horizon of Gulf of Mexico. Every sunset is different and the colors are sometimes truly incredible. It is not unusual to see deep purple next to emerald green. Seriously. Emerald green on the sky. And I’m lucky enough to have a great view of those fabulous sunsets from lanai. Even though there is a narrow island between me and the sea – the famous Siesta Key with even more famous Siesta Beach – the sunsets are incredible. The pinks and purples on this photo are incredible, don’t you agree? 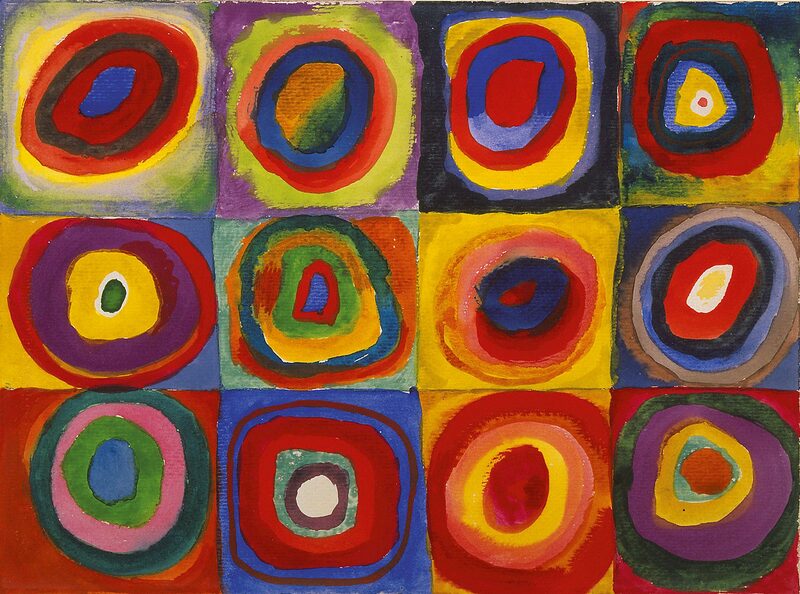 One of my great inspiration is Vassily Kandinsky. It is so cool that even though the official style of hard edge painting (which is my preferred style) started in the US, one of the fathers of abstract art was this guy from Russia. I named this painting “Sarasota Sunset” and created it specially for the Pelican Cove Art Show. It measures 24×36 inches and took me three works from start to finish. When preparing for my second painting I was inspired by this famous painting of Van Gogh…. It is called “Irises” and it was sold by Sotheby’s for record $53.9 million a few years ago. But the most important thing is that this painting is in my most favorite colors. Just love love love the cool green and that purple blue is to die for.